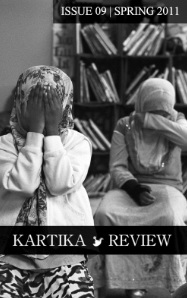 Kartika Review’s Spring 2011 Issue establishes its intent as an Asian-American literary journal quickly. The cover displays a lovely photograph of two girls wearing hijabs, their hands and forearms shrouding their eyes. In the first few pages Kartika describes itself as a journal that “publishes literary fiction, poetry, and non-fiction that endeavor to expand and enhance the mainstream perception of Asian American creative writing.” Later, in the mission statement, Kartika declares as striving “to create a literary forum that caters to and celebrates the wordsmiths of the Asian Diaspora.” In this, the terms of the journal are quickly established to the first-time reader. Comprised of equal parts fiction, poetry, and creative non-fiction (as well as two interviews), this is a journal whose first and foremost goals are clearly communicated to the reader as wishing to explore the issues and lives of Asians and Asian-Americans. With this expectation, it is then unsurprising that Kartika Review’s strongest offerings are pieces that grapple with issues of identity, duality, place, and community; themes that are highly germane to Asian-American literature. Katie Hae Leo’s essay, “My Life in Hair,” is a wonderfully complex piece, which follows the author’s personal relationship with her hair through a series of short, spare vignettes. For example, in the very the first scene, Leo uses her thick, black hair as an infant as a marker; it is that which separates her from her adoptive American parents, who “were shocked by all that hair.” From there on, Leo’s hair takes on a more and more complex role in her life, constantly changing and evolving as she does. She adopts “The Dorothy Hamill” hairstyle. She perms her hair. She goes natural. She cuts it all off, as a way to wound ex-boyfriends. And later, when in Korea, she tries to take on the popular Korean hairstyles, but is, despite her attempts, still very American. Within the narrow confines of “hair,” Leo mines a wealth of personal history that encapsulates a dizzying array of identities and roles. Dena Afrasiabi’s short story “The Give and Take” takes a different tack towards issues of identity, but is similarly effective in its play with duality and stereotype. In it, the “diaspora police” come to protagonist Soheila’s home to notify her of her inability to adhere to the expectations of her Middle Eastern background. Soheila, a quiet librarian, is too ordinary, too dull for an immigrant living in the United States, something the diaspora police hope to correct. Out of this, she is coaxed, prodded, and pushed towards a simple and singular identity from which she can be easily defined. A witty and sardonic piece, “The Give and Take” pokes fun at stereotypes while challenging the often narrow definitions of what it means to be an American and an immigrant. In contrast, Margaret Rhee’s poem, “Nectarines” is an incessant and weaving piece. It is an exploration into the history of nectarines, but is also more than that; it dips into the personal and impersonal, the absurd and the realistic, knitting myriad threads and exploring concepts of duality and hybridity across the fruit nectarine and being a Korean-American. Finally, the interview with Amy Chua (author of Battle Hymn of the Tiger Mother) near the end of the journal is a revelation. Earlier this year, Chua was made popular by the Wall Street Journal’s release of a chapter from her book, titled “Why Chinese Mothers Are Superior.” The reception to the chapter was polarizing. To some, the article was a reinforcement of many parental stereotypes, while to others, it was an authentic look into the cultural life and expectations of Asians and Asian-Americans. What’s unique about the interview is that Chua is allowed the space and nuance to explain not only her narrative intention of the book, but also her perspective as a writer and memoirist. For example, Chua explains how she utilizes an unreliable narrator (herself) at the beginning of the memoir. She notes that, “I am not the ‘I’ that speaks in the opening chapters of the book (which were quoted at length in the Wall Street Journal excerpt under a headline I never saw and did not choose!). The narrator of my book is a patently flawed character — initially obtuse, boastful, outrageously confident — who goes through crisis and transformation.” Beyond this, Chua talks about her process as a writer, and deftly paints a picture of herself not only as an author and memoirist, but as an individual and mother. The interview is an especially welcome one because it allows for an alternative perspective of an Asian-American writer whose reputation had perhaps already been decided by many who have never heard of her before. From these works, one can see how Kartika Review strives to expand the notions of Asian-American literature. Grappling with preconceived notions of nationality, identity, and stereotypes, the journal attempts to not only demarcate the expectations of Asian-American writing, but, maybe more importantly, expand and push against them. In this issue there are tiger mothers who are more than they seem, adopted children exploring the character of their hair, the entomology and history of nectarines, diaspora police, and much more that couldn’t possibly all be covered in this review. This issue is a taste of the Asian and Asian-American voice and experience, but more importantly, a chance to challenge and expand the notions of what Asian-American literature can and should be. Eric Tanyavutti was born and raised in the suburbs of Chicago, and is currently earning his MFA at the University of Illinois for Fiction. 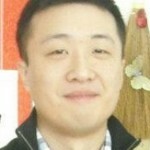 His stories have been published in the Potomac Review and Roanoke Review, and will be forthcoming in Cream City Review.